boberdoo’s login security feature allows you to require two-factor authentication for any admin, partner or vendor that logs into your system. Two-factor authentication is a system access security feature that requires the user to verify their identity at two separate touch points. Once both steps are completed, the user can log into the system. Two-factor authentication is managed at the user level in the boberdoo system. Go to Settings > Mange Users > Edit User to enable two-factor-authentication for the individual user. Never: Two-factor authentication is not required. When a new device detected: Two-factor authentication is required each time the user tries to access the system from a new computer, tablet or mobile device for the first time. Always (On each login): Two-factor authentication is required upon every login attempt. 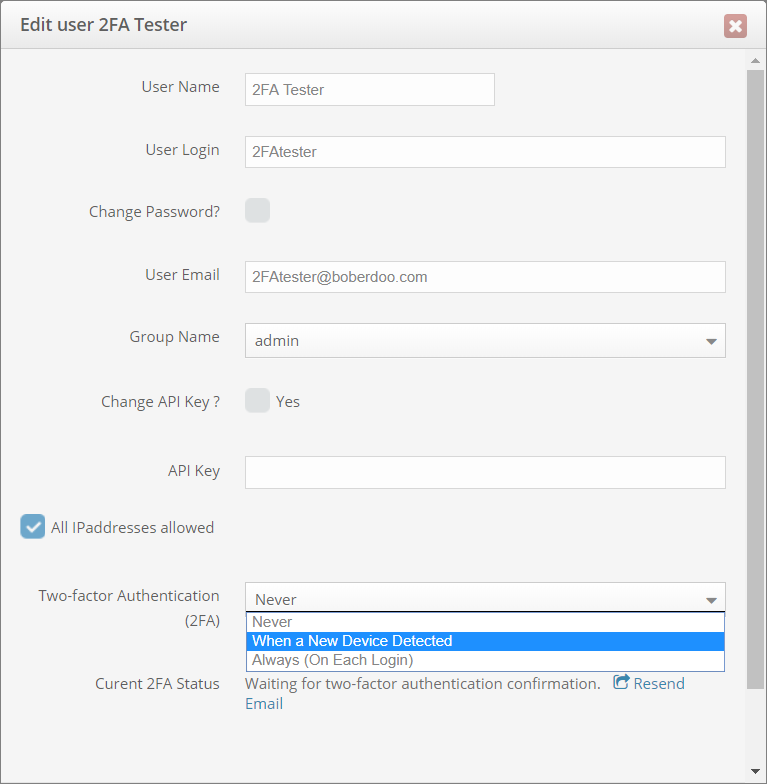 Once two-factor authentication is enabled for a user, a confirmation email is sent to the user to confirm the activation of the two-factor authentication feature. The user must click the link contained in the email to enable two-factor authentication. Once confirmed, the corresponding two-factor authentication rule will remain in effect indefinitely unless the two-factor authentication rule is changed to Never for the user. The above rules and setup process can also be applied to any of your partners and vendors when they log into the system. If you have any questions about two-factor authentication or if you do not see the two-factor authentication rules when editing an admin user, partner or vendor, please contact support.